Dunkermotoren has launched a new series of linear positioning actuators featuring a lightweight yet robust, ball-bearing mounted lead screw and powered by a compact brushless DC motor with integrated positioning controller. 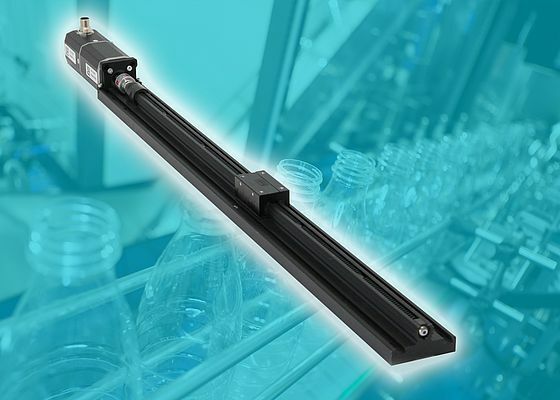 The LPA08 linear positioning actuator is a compact and modular drive system suited to industrial and medical automation applications which require fast, precise and smooth positioning. For example, product placement and palletising, label printing and scanning, bottle filling, packaging, diagnostics and laboratory automation. The feed movement, which is designed for loads up to 20 kg, maximum axial forces up to 150N and adjustment speeds of up to 0.6m per second, is driven by a Dunkermotoren BLDC BG45 motor (12 VDC and 24 VDC) with integrated 4Q-Servo controller and is able to be easily programmed with multiple positions, speed and force. The actuators stainless steel spindle is coated with Kerkote TFE (Teflon) which ensures maintenance-free, long-life operation and removes the need for additional lubricant, while superior damping properties, quiet operation and backlash free linear movement are optimised by a pre-loaded nut. To ensure maximum application flexibility the mounting of the linear drive can be selected for horizontal, vertical or overhead positioning with travel up to 1 metre available as standard in increments of 200mm, although longer strokes distances are available on request. Control options and interfaces include CANopen, Profibus and EtherCAT.